In this compilation of essays written over the course of 30 years, poet-author Peter Clothier explores the importance of grace and perseverance in the life of the artist, especially in a society that puts value in fame and fortune. 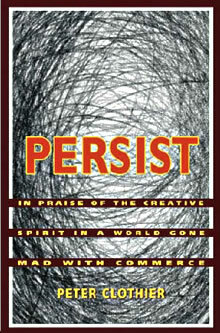 Persist is the creative’s survival guide to finding courage and purpose in his or her work. The book celebrates and encourages the amateur, a word that hadn’t been originally tied to such negative connotations. There was a historical nobility in being an amateur — these people were lovers of their art, passionately dedicated, and without expectations of money or reward. A former dean of an art institute, he realized how cruel the system was to offer expensive degrees to students, only to spit them out into a shrinking art market. “What results,” Clothier says, “is a disconnect between what students have been led to expect and the realities that await them.” That’s why it’s so important for us to create for ourselves, improve our skills and establish an awesome support system with other creatives. Clothier touches on elements that can hinder creative development, such as subconscious self-sabotage or getting stuck at a day job. But he also explains how to cultivate positive habits like meditation, collaborating with others and sharing your personal insights with the world through your work. If you’re curious to know what drives the creative mind, this book is a great start to develop an understanding. And if you’re an artist who’s somehow lost motivation, Persist will spark your confidence and reignite your urge to create. It’s more than an informative guide on how to thrive in your work — it also acts as a spiritual lighthouse in times of darkness. Got any suggestions for great titles similar to Persist? Share them in the comments below! You Are Not Running Out of Time, Rahul Bijlani. Life isn’t a race. Rahul Bijlani’s thoughtful essay will remind you to work at your own pace. TEDxFullerton Talk, “Heeding the Call,” Peter Clothier. The author of Persist discusses answering the call of what you’ve been given to do with your life. As a poet, Clothier fell into teaching to make a living as a writer. However, he realized academia was not for him and so he decided to write for himself.